I'm still alive! Things have a been kinda sorta crazy around here lately but I did manage to write up a fun tutorial to share with you. A few weeks ago I was contacted by Carolyn from Accuquilt. She asked if I'd be interested in trying out a Go! Baby cutting machine. Uhhm, heck yeah. So, she sent one over to me along with 3 dies of my choice. I ended up going the practical route and chose three basic shapes dies. Though after seeing Jess's post, I do wish I'd gone with at least one fun flower die! Ok, so on to the tutorial! One of the dies I chose was a rag square. I've made rag quilt loveys and a crib sized rag quilt the old school way where I snipped everything by hand. I'm not gonna lie. . . it's not fun. At all. The Go! Baby and this particular die make it sooooooo much easier. 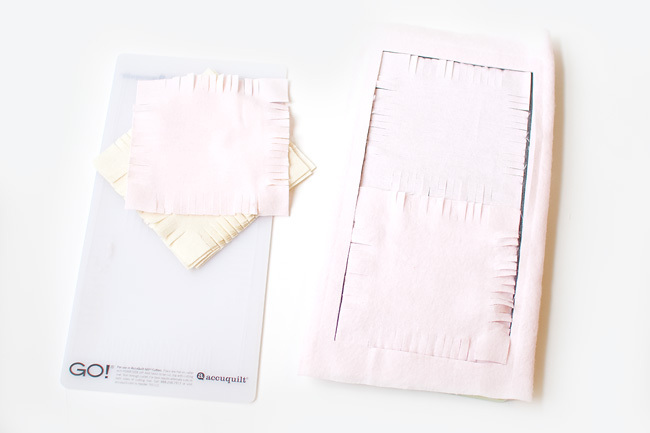 First, cut 2 strips of flannel long enough to cover the die and twice the width so you can fold it over. This will yield 8 squares. Cut another piece of flannel large enough to cover just one square of the die. Since flannel is a bit thick, I stuck with 2 layers at a time. You'll end up with 9 squares each of your flannel colors. I cut my fabric strips on the big side to save time but it's not necessary. Once you have your die ready, you simply crank it through the Go! Baby cutter and your shapes are cut out. Simple as that! 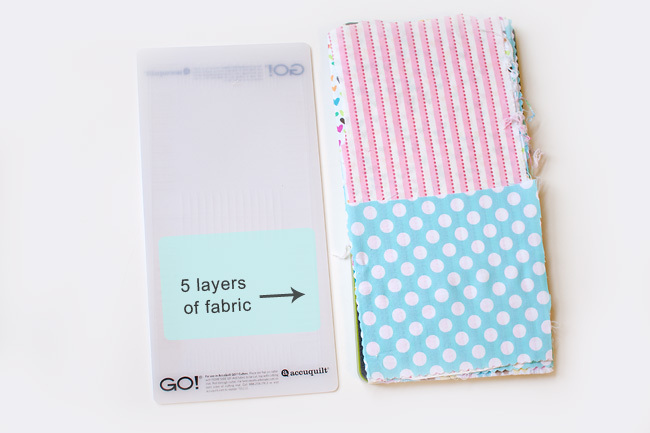 Next, you'll want to layer your other fabrics onto the die. I layered them all together to see if I could cut them all at once. Yup! Took a tiny bit more elbow grease but definitely saved time. 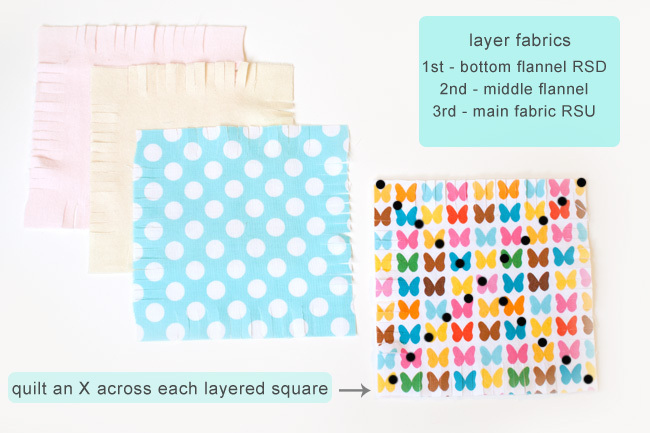 You should now have 27 squares of fabric to work with! 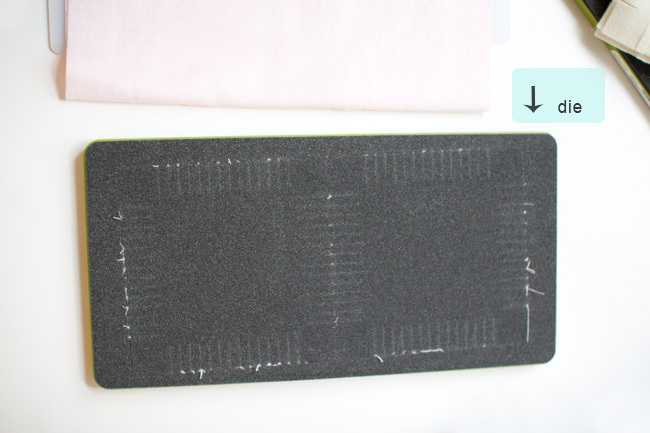 You'll stack your fabrics according the the photo above and draw an X across each square from corner to corner using a fabric marking pen. 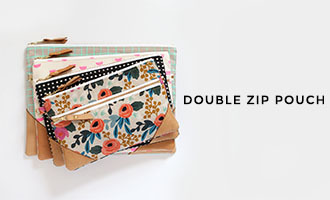 Sew across each X you drew. A quilting foot comes in handy for this step if you have one. *RSD - right side down / RSU- right side up. Once you have all your squares quilted simply decide on a lay out and then sew your squares together wrong sides touching. I used a seam allowance just under an 1" wide. I sewed 3 rows of three and then sewed the rows together. Afterwards, I stitched a zig zag border all the way around the lovey and added a little chevron twill tape loop. 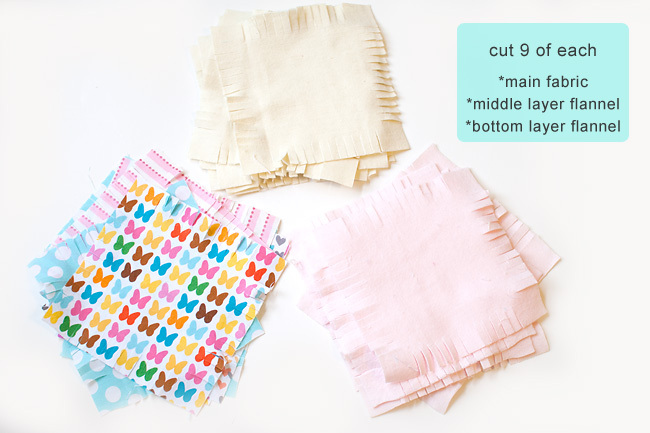 There will be just a few spots where you'll need to snip with scissors or rag quilt snips (the die leaves the corners intact to make it easier to sew the squares together). 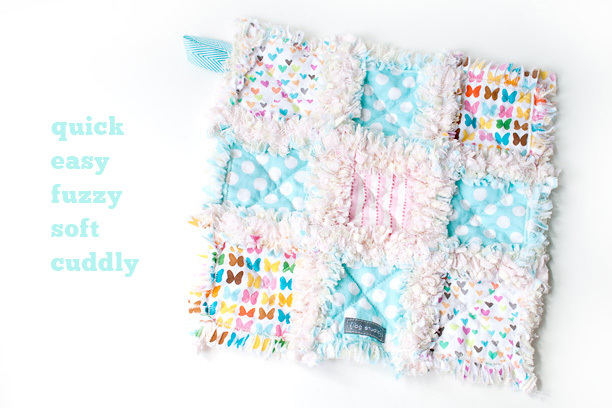 Throw it in the wash to fluff it up and you've got yourself a sweet lovey for any baby or toddler. Overall, I think the Go! 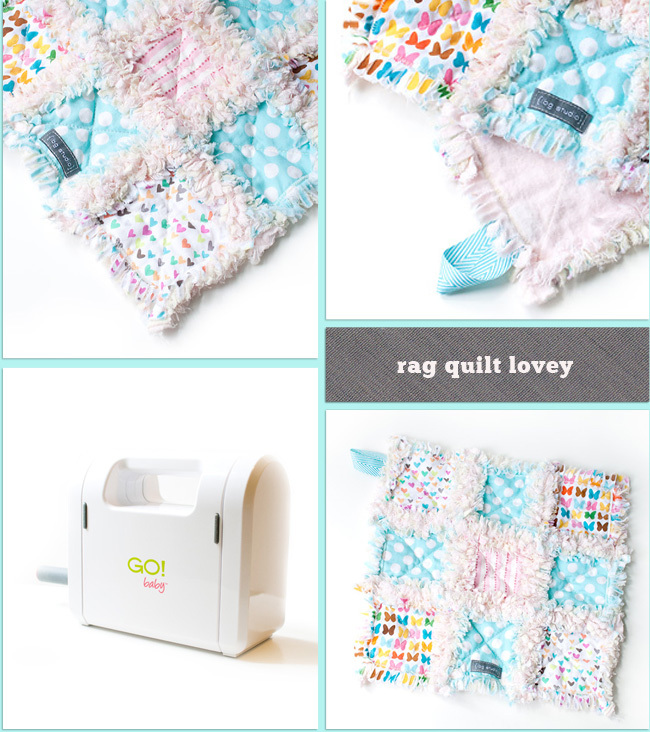 Baby is a really cool gadget to have in your sewing room/nook/closet/etc. It doesn't take up much space at all, is incredibly easy to use, and definitely a time saver. 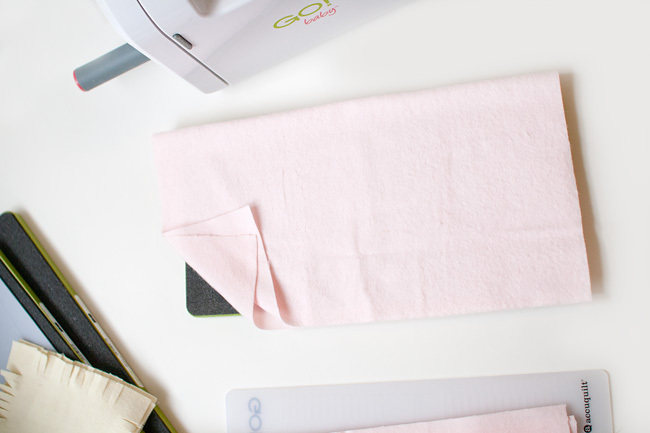 Looking for more sewing ideas? 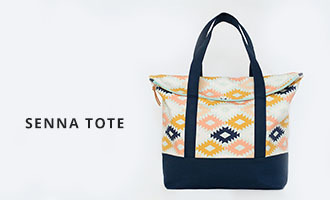 Click below and register your email to receive 22 free patterns! oooh awesome! It looks so cozy and cuddly! 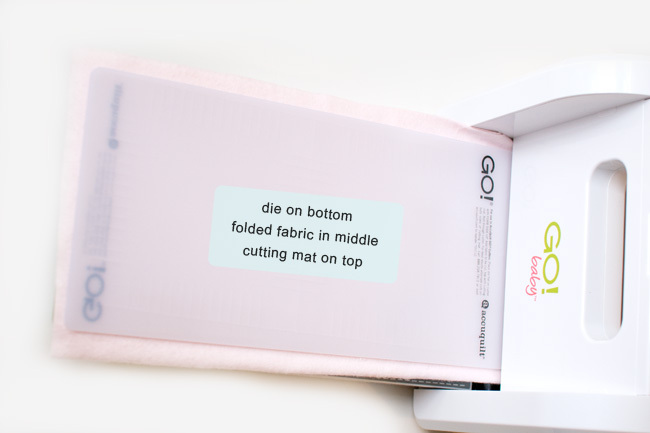 How cool that it does all that snipping for you! I've looked at this baby before and a rag die would definitely be on my list. I love your quilt! 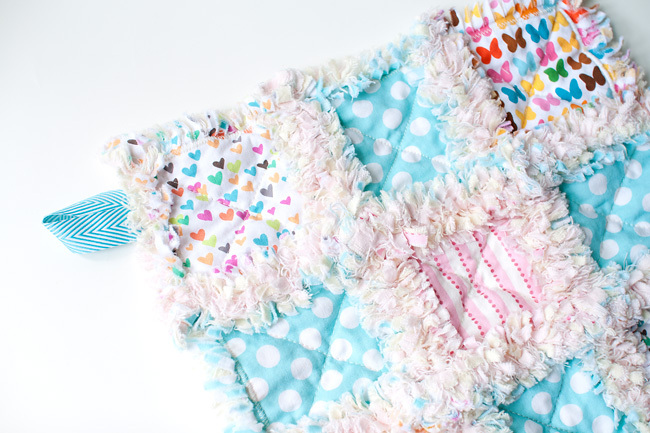 love rag quilts and that one is super cute. gotta get me ufo out and finish it!